Good morning , hope this post finds you in great mood and spirit. Today i have a beautiful money envelope adorned with bunch of tulip flowers. The finish card measures 7-1/2 x 4. Here is how i created this envelope. Cut green cardstock 12 x 7-1/2 , Score at 4 & 8 and fold. cut one side 1/2 inch smaller,paste the edges and the envelope is ready. Cut Soft Finish Cardstock 3-3/4 x 7-1/4. Embossed with Heart String Embossing Folder and sponge the inks on top.Paste on top of envelope leaving 1/4 inch border. Die cut Soft Finish Cardstock with GN Tulip 2 die , Sponge the petals and leaves with inks. 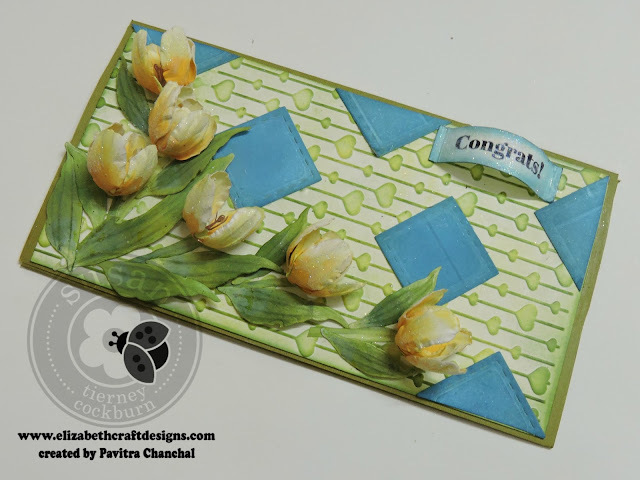 Shape the flowers with Susan's Tools , embossing folder and leaf pad.Die cut 4 squares using Stitched Square Die with blue cardstock, Cut two squares into halves and do the final placement of flowers and squares as shown. Apply Silk Microfine Glitter - Cool Diamond on the edges of flower petals. See you soon till next blog post. Archival inks & Colorbox ink. Is there an assembly video for the tulips 2? The tulip video I find is one from the older set.